I was raised in New Jersey in a family that encouraged creativity. An ever present abundance of art materials to experiment with and a myriad of art classes set the course to my lifelong love of art. My formal study began as I attended the Newark School of Fine and Industrial Arts in Newark New Jersey where I received a diploma in textile design. In 2006, following a nearly three decade long career as a textile designer and the outsourcing of my work, I moved to a small rural town in central NC where I planted a large garden. Serendipitously, I sowed the seeds that would guide my artistic voice and catapult me into becoming a full-time mixed media sculptor. My professional life as a 2-D artist came to an end (or maybe just a pause) opening new doors of creativity to me as a professional 3-D artist. A deeply felt connection to the natural world compels me to create works of art made from nature, primarily Lagenaria siceraria. 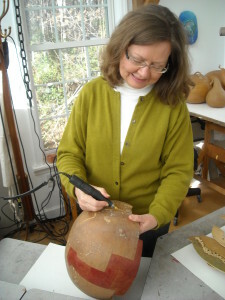 My creative process using hard shelled gourds as art medium is an intimate journey with nature that spans many seasons. It begins with planting in early spring and caring for the plants until harvest in late fall, then continuing on with a year long curing process before I can clean and properly prepare the gourd for artwork. Next comes the really fun part – conceptualizing and putting pencil to gourd. Once I am satisfied with the layout, I begin the processes of carving, sculpting and painting. Finally, I seal each piece inside and out with several coats of a protective finish. Living close to nature, I find inspiration all around me. I am intrigued by natures’ recurrent fractal patterns; the repetition of color, texture and form recurring throughout nature from the micro to the macro. I see this as a reflection of our inherent interconnection with all of life. My work celebrates the beauty and wonder of natures’ design and honors her resilience as well as her fragility. My work has won numerous awards and can be found in collector’s homes and businesses both nationally and internationally. 72nd Annual NC Gourd Festival, Raleigh NC.